If you are going to do your own fireworks display, make sure you only buy ones with the British Standard Kitemark BS7114. Measure out a ‘clearance distance’ for your spectators to stand – usually 5 to 40 metres depending on the fireworks you’ve chosen. Read the instructions very carefully and light with a taper at an arm’s length. Stand well back and do not go back to a firework once it’s lit. If the firework hasn’t gone off, leave it as it could still explode and tell your guests to steer clear of it. Keep fireworks in a closed box before use – never put them in your pocket. Never throw them and never allow anyone under the age of 18 to handle them. Ideally one responsible adult should be in charge of lighting the fireworks, and if you are that adult, then it’s best not to consume any alcohol. Children love sparklers, but never give any if they are under age 5. Make sure your child is wearing gloves, and put the used sparklers in a bucket of water after use. Always light sparklers one at a time, and never hold a baby or child if you have a sparkler in your hand. If your children want to wear fancy dress, please check their outfits are non-flammable. If you are having a bonfire, make sure it is built as far as possible from buildings, sheds, fences and hedges, and where there are no trees or shrubs with overhanging branches. Your bonfire heap should be made of materials such as logs stacked with gaps or even wooden pallets, with newspaper stuffed in. This way air will be able to get in at the bottom of the heap and then rise. Never light the bonfire with flammable liquids, and never burn dangerous items such as batteries, paint cans, foam furniture, aerosols etc. 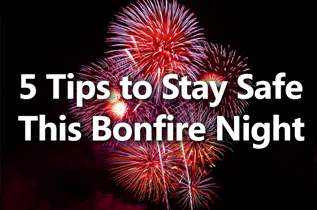 Make sure someone is keeping an eye on the bonfire all night, and keep children at a safe distance from it. Cats and dogs are often afraid of fireworks and the loud bangs. To keep them secure, walk dogs during daylight hours, and keep cats and dogs indoors when fireworks are being set off. Close curtains and windows, put music or the TV on to muffle the sound of fireworks, and make sure your pet has somewhere to hide if he/she wants to. Most of this is common sense, and whilst we always recommend going to an organised fireworks display, if you decide to have your own private display, please be safe to prevent any accidents. And do share these tips with your friends and family.